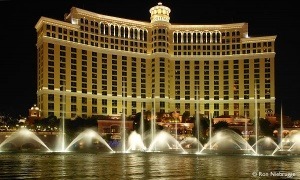 Flames have engulfed the roof of the world-famous Bellagio Hotel and casino in Las Vegas. Footage taken by onlookers shows the fire on the roof of the south side of the hotel’s lake. Emergency crews responded to the fire at the luxury hotel on the city’s strip famous for its fountain display just before 11pm local time. The hotel has nearly 4,000 rooms, making it one of the biggest in the world, and its fountain – a huge display which changes in time to music – is a tourist favourite. Clark County Fire said the situation was “extremely difficult” due to the location of the fire and access to the location, local TV network channel KTNV reports. A total of 77 firefighters are reported to have battled the flames, which have now been put out.